Singapore Airlines Flight 006 departed Singapore for a flight to Los Angeles via Taipei. Scheduled departure time at Taipei was 22:55. The flight left gate B-5 and taxied to taxiway NP, which ran parallel to runway 05L and 05R. The crew had been cleared for a runway 05L departure because runway 05R was closed because of construction work. CAA Taiwan had issued a NOTAM on Aug 31, 2000 indicating that part of runway 05R between Taxiway N4 and N5 was closed for construction between Sept. 13 to Nov. 22, 2000. Runway 05R was to have been converted and re-designated as Taxiway NC effective Nov. 1, 2000. After reaching the end of taxiway NP, SQ006 turned right into Taxiway N1 and immediately made a 180-degree turn to runway 05R. After approximately 6 second hold, SQ006 started its takeoff roll at 23:15:45. Weather conditions were very poor because of typhoon 'Xiang Sane' in the area. METAR at 23:20 included Wind 020 degrees at 36 knots gusting 56 knots, visibility - 600 meters, and heavy rainfall. On takeoff, 3.5 seconds after V1, the aircraft hit concrete barriers, excavators and other equipment on the runway. The plane crashed back onto the runway, breaking up and bursting into flames while sliding down the runway and crashing into other objects related to work being done on runway 05R. The aircraft wreckage was distributed along runway 05R beginning at about 4,080 feet from the runway threshold. The airplane broke into two main sections at about fuselage station 1560 and came to rest about 6,480 feet from the runway threshold. - At the time of the accident, heavy rain and strong winds from typhoon "Xangsane" prevailed. At 2312:02 Taipei local time, the flight crewmembers of SQ006 received Runway Visual Range (RVR) 450 meters on Runway 05L from Automatic Terminal Information Service (ATIS) "Uniform". At 2315:22 Taipei local time, they received wind direction 020 degrees with a magnitude of 28 knots, gusting to 50 knots, together with the takeoff clearance issued by the local controller. - On August 31, 2000, CAA of ROC issued a Notice to Airmen (NOTAM) A0606 indicating that a portion of the Runway 05R between Taxiway N4 and N5 was closed due to work in progress from September 13 to November 22, 2000. The flight crew of SQ006 was aware of the fact that a portion of Runway 05R was closed, and that Runway 05R was only available for taxi. - The aircraft did not completely pass the Runway 05R threshold marking area and continue to taxi towards Runway 05L for the scheduled takeoff. Instead, it entered Runway 05R and CM-1 commenced the takeoff roll. CM-2 and CM-3 did not question CM-1's decision to take off. - The flight crew did not review the taxi route in a manner sufficient to ensure they all understood that the route to Runway 05L included the need for the aircraft to pass Runway 05R, before taxiing onto Runway 05L. - The flight crew had CKS Airport charts available when taxing from the parking bay to the departure runway; however, when the aircraft was turning from Taxiway NP to Taxiway NI and continued turning onto Runway 05R, none of the flight crewmembers verified the taxi route. As shown on the Jeppesen "20-9" CKS Airport chart, the taxi route to Runway 05L required that the aircraft make a 90-degree right turn from Taxiway NP and then taxi straight ahead on Taxiway NI, rather than making a continuous 180-degree turn onto Runway 05R. Further, none of the flight crewmembers confirmed orally which runway they had entered. - CM-1's expectation that he was approaching the departure runway coupled with the saliency of the lights leading onto Runway 05R resulted in CM?1 allocating most of his attention to these centerline lights. He followed the green taxiway centerline lights and taxied onto Runway 05R. 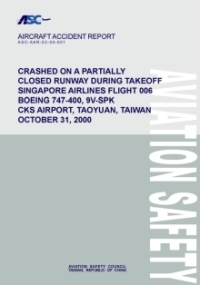 - The moderate time pressure to take off before the inbound typhoon closed in around CKS Airport, and the condition of taking off in a strong crosswind, low visibility, and slippery runway subtly influenced the flight crew's decision?making ability and the ability to maintain situational awareness. The flight crew lost situational awareness and commenced takeoff from the wrong runway. The Singapore Ministry of Transport (MOT) did not agree with the findings and released their own report. They conclude that the systems, procedures and facilities at the CKS Airport were seriously inadequate and that the accident could have been avoided if internationally-accepted precautionary measures had been in place at the Airport. Develop and implement a comprehensive surface-movement training program that reflects the current practice in this area, such as the recommendations contained in the FAA’s National Blueprint for Runway Safety and FAA Advisory Circular 120-74. Ensure that procedures for low visibility taxi operations include the need for requesting progressive taxi instructions to aid in correct airport surface movement. Review the adequacy of current SIA PVD training and procedures and ensure that SIA documentation and operational practices reflect the CAAS approved B747-400 AFM PVD supplement, which included the use of the PVD to indicate whether the aircraft is in a correct position for takeoff. Develop and implement a clear policy that ensures that flight crews consider the implications of the relevant instrument indications, such as the PFD and PVD, whenever the instruments are activated, particularly before commencing takeoff in reduced visibility conditions. Include in all company pre-takeoff checklists an item formally requiring positive visual identification and confirmation of the correct takeoff runway. Implement an Advanced Crew Resource Management program to reflect current practices in this area, and ensure that such programs are regularly revised to reflect new developments in CRM. Review the adequacy of current runway condition determination procedures and practices for determining a water-affected runway to “wet” or “contaminated” in heavy rain situations, by providing objective criteria for such determinations. Conduct a procedural audit to eliminate existing conflicts in the guidance and procedures between the company manuals, the managers’ expectations, and the actual practices, such as those contained in the Typhoon Procedures and dispatch briefing policy. Modify the emergency procedures to establish an alternate method for initiating the emergency evacuation command in the event of a PA system malfunction. Review its procedures and training for the flight and cabin crewmembers to effectively handle diversified emergency situations. Require SIA to develop and implement a comprehensive surface-movement training program, to include a procedure to request progressive taxi instructions during low visibility ground operations. Review the adequacy of current SIA PVD training and practices and require that SIA revise, if necessary, procedural and training documentation and operational practices to reflect the CAAS approved B747-400 AFM PVD supplement. Review the current system of managing AFM supplement document approval, control, distribution, and enactment policies and procedures for operators and make appropriate changes as necessary to ensure that revisions to airline AFMs are adequately managed. Ensure that all Singaporean commercial airline operators under its regulatory responsibility implement Advanced Crew Resource Management programs to reflect current practices and ensure that such programs are regularly monitored and revised to reflect new developments in CRM. Evaluate and support appropriate research to develop technologies and methods for enhancing flight crews’ abilities for objectively determining a water-affected runway condition in heavy rain situations. Amend the CAAS Air Navigation Order paragraph 37 (3) to require an earlier power-on and later power-off times for CVRs. Establishe an independent aviation accident/incident investigation organization consistent with many other countries in the world. Require that the control tower chiefs re-emphasise the concept, training and the use of progressive taxi/ground movement instructions during low visibility ground operations. Place a priority on budgetary processes and expedites the procurement and installation of ASDE at airports with high traffic volume. Clearly redefines its Divisions’ job functions to stipulate each individual unit and personnel responsibilities. Specifically appoints an organisation within the CAA for the development, modification, and issuance of civil aviation regulations. Organise a program to continuously monitor ICAO SARPs and industry best practices for safety improvement and distribute them to the relevant organisations for applicable review, necessary action and oversight of their progress. Establish an integrated risk assessment and management program and oversight mechanism to supervise all plans and implementations. Evaluate and supports appropriate research to develop technologies and methods in providing objective information to pilots regarding water-affected runway conditions (wet versus contaminated) in heavy rain situations. Immediately implement all items, or acceptable alternative standards at Taipei and other airports that are not in compliance with ICAO SARPs and applicable documents, such as the SMGCS plan, the emergency medical procedure, etc. Ensure that the ARFF have the necessary manpower to perform their assigned tasks, as compared to similar level 9 international airports. Review the communication system at Taiwan airports to develop an integrated plan for improved communications between all agencies involved during emergency fire and rescue operations. Establish a reliable incident reporting system, promotes the system to the users’ groups and places a higher priority to the use of such a system. Review the FAA National Blueprint for Runway Safety and relevant Advisory Circulars with a view toward implementation. Ensure that appropriate surface movement technology enabling infrastructure, such as airport and terrain databases, is developed for all airports. Issue the necessary regulations to support the installation of cockpit-based surface guidance and navigation technologies, such as electronic moving map display, in Taiwan-registered aircraft engaged in regular public transport for use during airport surface movements. Establish professional oversight capabilities for the CAA’s safety improvement actions and programs for promoting flight safety. Proactively provides support to the CAA’s safety action plans, such as the ASDE procurement process. Grant full authorisation to the CAA to avoid lengthy waiting periods for improvement and implementation of technical safety regulations. Provide airline operators with appropriate guidance information, including cautions to be observed, when required to operate emergency evacuation slides in wind gusts that exceed the certified limit. Review the effectiveness of cabin emergency lights to ensure that maximum conspicuity is achieved in dense smoke following survivable accidents. Consider incorporating cockpit surface guidance and navigation technologies, such as an electronic moving map display, into all proposed and newly certified aircraft. Develop and issue the necessary technical support to airline customers to aid in the installation of cockpit surface guidance and navigation technologies, such as (an) electronic moving map display, for use during airport surface movements. Develop a means to reduce failure of PA systems during survivable accidents and provide modified systems to operators. Develop Standards that would require ASDE or comparable equipment as standard equipment at civil airports with high traffic volume. Amend Annex 14 to include clear Standards for defining and protecting a partially closed runway that may be used for taxi purposes. Consider accepting the participation of Taiwan in various ICAO activities as an observer, for the purpose of safety improvement, even though Taiwan is not a contracting State. Support the establishment of a government/industry program involving the Flight Safety Foundation, IFALPA, Airport Operations Association, and IATA to develop objective methods to assist pilots in assessing whether a runway is “wet” or “contaminated” due to the presence of water. Encourage and supports the establishment of research by governments and industry to improve passenger smoke protection and improve emergency evacuation slide performance in heavy winds and post-accident fire. Develop and issues the necessary SARPs to ICAO Member States’ regulatory authorities to encourage them to adopt the necessary regulations to support the installation and use of cockpit-based surface guidance and navigation technologies, such as (an) electronic moving map display. Encourage all ICAO Member States to consider the installation of cockpit surface guidance and navigation technologies, such as (an) electronic moving map display, in commercial airliners for use during airport surface movements. Encourage all their Member States’ regulatory authorities to ensure that appropriate surface movement technology enabling infrastructure, such as airport and terrain databases, is developed. Provide support to an international joint government/industry program to develop possible improvements to emergency evacuation equipment and procedures for the prevention of future injuries and death following an aircraft accident. Provide its member airlines with appropriate guidance information, including cautions to be observed, when required to operate emergency evacuation slides in wind gusts that exceed the certified limits. Urge its member airlines to work with their (respective) regulatory agencies to ensure that airports into which they operate meet the Standards and Recommended Practices of ICAO Annex 14 and urges its member airlines to work with their prospective regulatory agencies to develop procedures for evaluating the airport infrastructure as part of their out-station audits. Encourage its member airlines to consider equipping their aircraft with cockpit surface guidance and navigation technologies, such as (an) electronic moving map display, for use during airport surface movements. Review emergency slide design to reduce the potential for uncommanded inflation resulting from lateral impact forces. Initiate rulemaking action to require the installation, on Boeing aircraft, of public address systems that continue to function following survivable accidents. Should initiate rulemaking actions to require the installation, on Boeing aircraft, of public address systems that continue to function following survivable accidents. Distance from Taipei-Chiang Kai Shek International Airport to Los Angeles International Airport, CA as the crow flies is 10856 km (6785 miles).